Sterling fell by around half a percent on Friday morning as investors bet that Theresa May’s withdrawal agreement would be shot down in a parliament vote for a third time today. t was announced yesterday that UK politicians will have a final say on whether to support May’s deal on Friday after Wednesday’s indicative votes failed to yield a clear alternative to Brexit. With the UK set to leave the bloc on 12th April, this now looks very likely to be May’s last ditch attempt to force her deal through parliament. Her pledge to stand down should the deal pass has got some MPs on side although without the support of the DUP, and subsequently the hard line Tory ERG members, the deal again looks likely to be rejected. The vote will take place at 14:30 GMT, with the outcome to be known soon after. With a rejection heavily priced in, Sterling would soar on the unexpected passing of her deal. In the event that it fails, any indication that May will seek a long extension from the EU beyond the 22nd May could also be a positive for the Pound. A worse-than-expected set of German inflation numbers helped put the Euro on course for its worst monthly performance against the US Dollar since October on Friday morning. Headline inflation out of Europe’s largest economy fell unexpectedly in March, extending the string of fairly dire macroeconomic news out of the country. 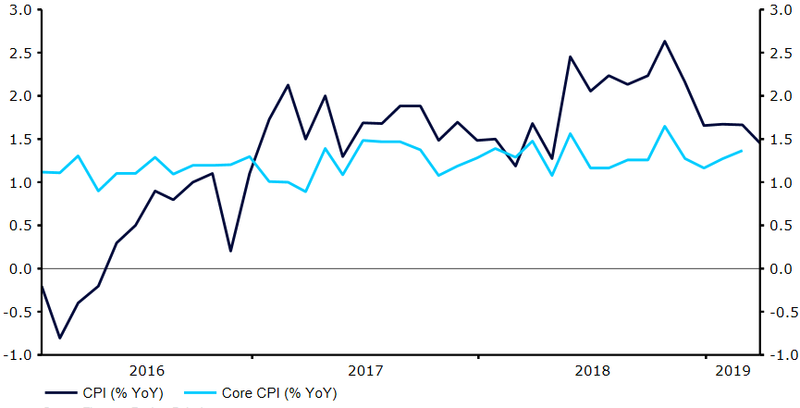 Consumer prices increased by just 1.3% year-on-year (Figure 1), well below the 1.6% that economists had priced in and the weakest pace of price growth in almost a year. The latest business and consumer confidence indexes for the Euro-area fared little better, with both falling short of consensus. Thursday’s soft economic news adds to the rather gloomy set of data out of the bloc that has caused investors to ramp up bearish bets against the Euro, while heightening expectations for a Euro-area recession in 2019. The FX market mostly overlooked yesterday’s disappointing GDP numbers out of the US, which showed that the world’s largest economy slowed more than initially expected in the final three months of 2018. US growth fell to 2.2% annualised, an even larger downward revision from the initial 2.6% estimate that economists had anticipated. The cooling in growth was largely a result of an easing back in consumer and government spending, while a number of indicators out of the housing and manufacturing sectors also showed signs of a slowdown. The reasons behind the lack of reaction in the US Dollar are likely two-fold. Firstly, the indicator runs on a lag, and is not necessarily representative of current conditions. Secondly, the number was probably deemed by investors as unlikely to have any significant bearing on monetary policy. The Fed has already signalled that it does not expect to alter interest rates this year and, unless we see a sharp slowdown in growth far below current levels, the chances of a rate cut, in our view, remain pretty low.